Selling bootleg goods, playing the numbers, squatting rent-free, scamming tourists with bogus stories, selling knockoffs on Canal Street, and crafting Ponzi schemes--this vivid account of hustling in New York City explores the sociological reasons why con artists play the game, and the psychological dynamics they exploit to win it. Terry Williams and Trevor B. Milton, two prominent sociologists and ethnographers, spent years with New York con artists to uncover their secrets. The result is an unprecedented view into how con games operate, whether in back alleys and side streets or in police precincts and Wall Street boiler rooms. This book is not only an absorbing read but also a sophisticated study of how con artists use verbal persuasion, physical misdirection, and sheer charm to convince others to do what they want. 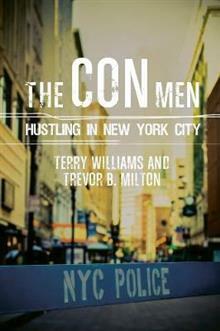 Williams and Milton examine how street hustling is an act of performance art and find meaning in the methods con artists use to exact bounty from unsuspecting tourists and ordinary New Yorkers alike. They explore the personal experiences and influences that create a successful hustler, building a portrait of unusual emotional and psychological depth. Their work offers a new take on structure and opportunity, showing how the unique urban and social architecture of New York City lends itself to the perfect con.